A counter-trend strategy is basically a contrarian trading strategy that aims to benefit from the tendency of investors to overreact to news in the short-term. Although many investors find it pretty intuitive that trend-following capitalizes on the market’s tendency to continue rising (falling) over the course of the future months if it has been rising (falling) over the previous months, it is less intuitive that the complete opposite occurs in the very short-term. For instance, if prices have increased significantly in recent days, there’s a strong probability that the short-term price trend will reverse in the following days. The larger the amount and duration of the rise or fall for a security in the near-term, the larger the probability that there will be a sizeable price correction in the near future, when the security’s price moves in the opposite direction. To illustrate this idea of a counter-trend trading strategy in action, take a look at the following chart, which shows a simple example of possible buy and sell signals based on whether the price of the SPDR S&P 500 ETF (ticker: SPY) is trading at a new 10 day high or 10 day low. Expecting price reversion after investors drive prices up to a near-term peak, a counter-trend trader in this example should short SPY (or hold an inverse S&P 500 ETF, such as the ProShares Short S&P500 ETF Ticker:SH) after experiencing a 10 day high. On the other hand, when prices reach a 10 day low, the counter-trend theory suggests that the investment is expected to rise in the following days, and the investor should take a long position in SPY. Also, notice how the return profile of the short-term counter-trend trading strategy follows a stair step function, since it only experiences the price movement of SPY following a 10 day high or low, which occurs on nine separate days in the following chart, and the rest of the time it’s sitting in cash. It’s pretty clear from the previous graph that the price of SPY appears to revert, if only for a few days, following a 10 day low or 10 day high. Admittedly, this was a cherry-picked illustration to show how counter-trend works and also how it has the ability to profit during periods of flat, non-trending markets. Applying these 10 day high and low signals for SPY over much longer periods of time actually gives a much better look at how counter-trend trading can be expected to perform. Investing based on the same short-term counter-trend strategy that was referenced in the example above with a one day holding period after each 10 day high or low price is actually pretty profitable over long periods of time. Not only were the majority of trades profitable, considered “winning” trades, but this simple counter-trend example generates equity-like returns with a -0.24 correlation of daily returns to SPY. Furthermore, since the short-term counter-trend strategy is only exposed to the market by holding SPY for roughly 1/3 of the possible days since 1993, holding cash the other 2/3 of the time, it makes sense that this strategy had significantly less risk than a buy & hold investor would’ve had over this period. Details of this simple counter-trend strategy example can be found in the following table. Although trend-following is a great strategy when applied to investing in longer-term timeframes, short-term counter-trend is a far superior signal to use when it comes to trading in near-term, short-duration time frames. The following table compares the performance of seven hypothetical investments over the past 24 years since SPY’s inception: a buy & hold allocation to SPY, three short-term trend-following portfolios that buy (sell) after a 10 day high (low), and three short-term counter-trend portfolios that do the opposite and sell (buy) after a 10 day high (low). I included multiple trade durations to further illustrate the persistence of price reversion in the days following a near-term price extreme. There’s a consistent theme across the one, three, or five days holding periods that follow the 10 day high or low price signal: price direction reverses! Counter-trend strategies add value, and trend-following strategies detract value using these very near-term signals. Going in a bit more detail to better illustrate the point, counter-trend strategies are only invested in the market for a small fraction of the time, compared to a buy and hold investor. 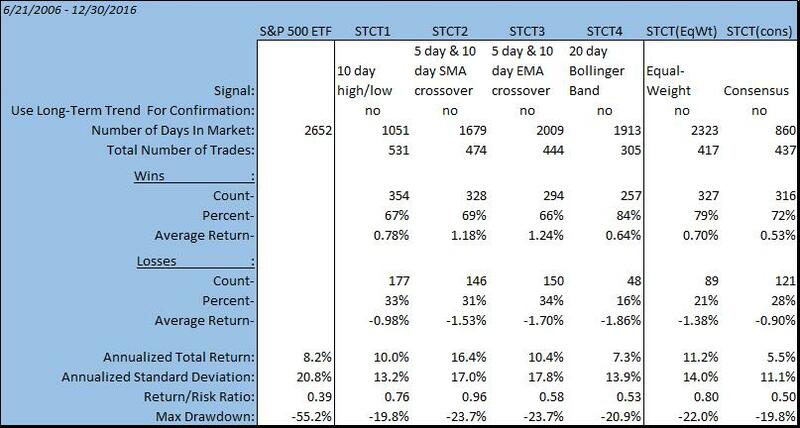 For instance, the STCT (1D) strategy held SPY for 2273 days, out of a possible 6025 days for the buy and hold investor. Depending on which counter-trend signal is being used and the duration of the trade, the amount of time spent waiting in cash between trades can vary, resulting in market exposure only a half or a quarter of the market days on average. As anticipated, holding cash for the majority of the time ends up reducing the risk of counter-trend strategies significantly when compared to a buy and hold investor; both standard deviation and maximum drawdowns tend to be reduced, which usually results in a higher Sharpe ratio for these strategies. When the strategy does actually take a long or short position in the market, expecting a near-term reversal, it only holds the position for a couple days at a time. During this period, either the short-term trend reverses as expected, and the strategy profits, or it continues with the short-term trend, and the strategy books a loss for that trade. The beauty of the strategy is that the trades are usually held for such short durations that these small wins and losses often average out to be roughly the same size; the profitability of the strategy almost entirely relies on making more winning trades than losing trades. The percent of winning trades can be expected to be between 50% and 75% for most counter-trend strategies. Of course, there will be periods in the short-run when STCT dramatically deviates from these norms, but it’s reasonable to expect these historic trends for counter-trend trading strategies to continue over full market cycles. In addition to seeing these signature counter-trend strategy characteristics for the three versions of the STCT 10-day high/low signal, these tend to hold true across various other versions of STCT signals. 10 Day High or Low Price – Go long (short) when the price of the security reaches a 10 day low (high). Simple Moving Average (SMA) Crossover – Moving average crossovers can be used when a security’s price crosses over its moving average, when two different moving averages cross over each other, or a combination of the two. One example of implementing a counter-trend strategy based on a combination of moving average signals would be to go long (short) the security when its price is below (above) it’s 5 day SMA and when its 5 day SMA is below (above) its 10 day SMA. Exponential Moving Average (EMA) Crossover – A slightly different variation would be to use exponential moving averages in place of the simple moving averages. For instance, go long (short) the security when its price is below (above) it’s 5 day EMA and when its 5 day EMA is below (above) its 10 day EMA. Bollinger Bands – Another commonly used counter-trend signal involves using some version Bollinger bands. These are a bit more complicated to describe, but the basic premise is that security prices are generally normally distributed over short timeframes. For instance, ~95% of price movements will be within two standard deviations of the mean price over the most recent twenty trading days. Considered another way, there is only a 2.1% chance of the security price being more than two standard deviations above the trailing 20 day SMA and the price often comes down after being up in that zone; the converse is true for being more than two standard deviations below the 20 day SMA. Putting this into practice as a trade signal, a trader would go long (short) any time the security price is below (above) two standard deviations below (above) the trailing 20 day SMA. Equal-Weight Signals – Knowing that each of the previous four signals should work on their own, but are each prone to strings of losing trades when used separately, an equal-weight approach has the goal of diversifying signal risk when implementing a short-term counter-trend strategy. High Conviction Signal – Another way of implementing these four signals is through a high conviction / lower turnover approach that only enters long or short positions when all four independent counter-trend signals are in consensus. The performance of these six hypothetical counter-trend strategies can be found in the following table. Due to the limited history of the inverse S&P 500 ETF (ProShares Short S&P500 ETF Ticker:SH), which is one of the easiest ways for an investor to short the S&P 500 for very limited periods of time, the following backtested performance only goes back to the inception of SH on 6/21/2006 to give an idea of what fully implementable versions of short-term counter-trend strategies could have looked like. 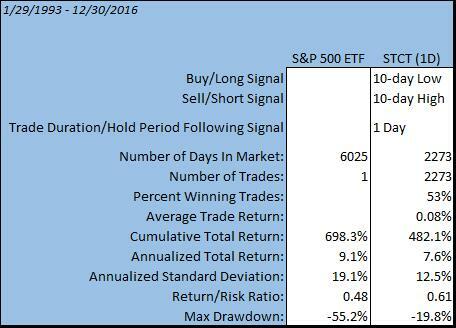 Not only do each of the unique counter-trend strategy signals produce significantly higher risk-adjusted returns than a buy & hold strategy with SPY over this period, but they also are able to cut the max drawdown of SPY in half while only being invested a fraction of the days. 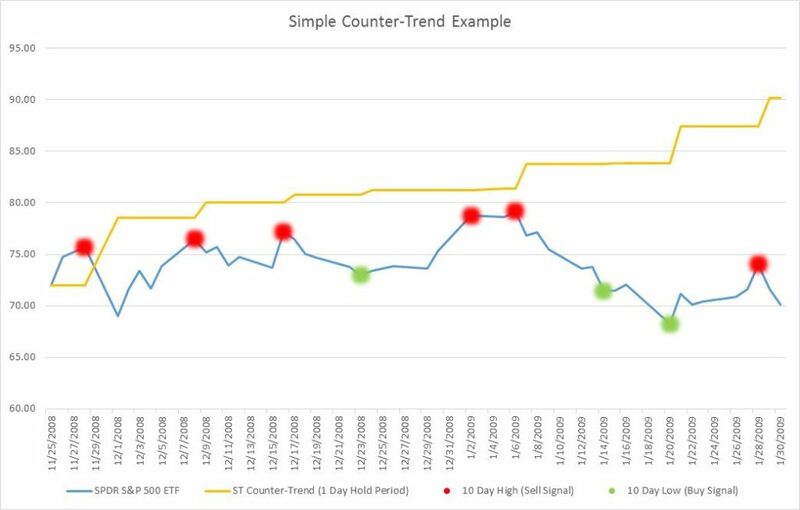 Although these six variations of counter-trend strategies look pretty impressive already, another interesting thing to note is that adding an additional trend signal to the underlying short-term counter-trend signals can actually further improve the risk characteristics. The theory behind it is that it’s much better to trade when both the short-term counter-trend signal and the intermediate-term trend signal are aligned; adding a ‘trend filter’ effectively cuts off the lower probability short-term counter-trend trades that go against the intermediate-term trend of the security. For instance, if SPY is at a near-term high price, the counter-trend signals might suggest to take a short position, despite whether the S&P has been in a roaring bull market for many months and is continuing to make new highs; however, there’s much more risk in shorting a security that exhibits positive intermediate-term price trends. Instead, applying intermediate-term trend filters to these short-term counter-trend signals allows the models to trade based on the highest probability scenarios when both trend and counter-trend signals agree with each other. 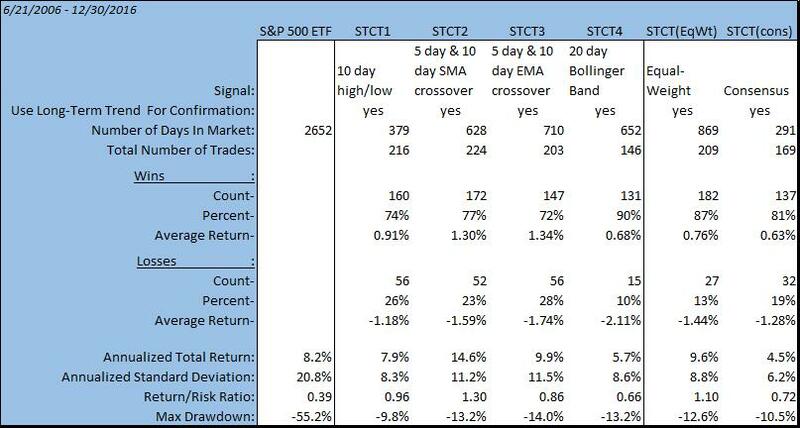 For instance, applying a 70 day/200 day EMA crossover to determine trend, the following table shows how each of the seven counter-trend strategies would have performed if they only entered long trades when SPY was in a positive trend and short trades when SPY was in a negative trend. Adding this trend confirmation does an incredible job of reducing risk, both standard deviation and maximum drawdowns, but it also reduces returns slightly for all six versions of the counter-trend models. Since this trend filter removes many of the lower probability trades from occurring, it also reduces the overall number of trades significantly, and effectively cuts the number of days in the market to less than a third of the market days a buy & hold investor would have held SPY. Hopefully the previous tables of backtested performance were able to illustrate how short-term counter-trend works over long investment time horizons, but as with any strategy, there are going to be periods when counter-trend will experience performance that varies significantly from the long-term average. Counter-trend trading is somewhat similar to flipping a coin, since you expect it to land on heads roughly half of the time, but you know that each flip is independent of the last flip and these random outcomes often produce long strings of flipping heads in a row. The good news is that counter-trend trading is actually a higher probability event than the 50% chance of flipping a coin on heads. While it’s not unreasonable to expect counter-trend trading strategies to produce winning trades somewhere around 60% or 70% of the time over long time horizons, the strategy is also expected to experience strings of winning and losing trades in the short-term. For instance, my first counter-trend strategy example that traded in the very narrow period of time between 11/25/2008 and 1/30/2009 was used to illustrate how the strategy performs when prices revert as anticipated; this admittedly cherry-picked example showed nine straight profitable trades in a row, which is obviously one of the most profitable strings of winning trades and is not a good indication of an investor’s actual experience of implementing a counter-trend strategy over longer periods. On the other hand, this same strategy would have experienced its largest drawdown over the entire backtest only a couple months earlier in October of 2008 when it had five losing trades in a row that resulted in a 19.8% drawdown. As with any investment strategy, short-term counter-trend investors should anticipate that they will almost never experience the long-term average return in any given year. Seen in the following table of annual total returns for each of the counter-trend variations, there are often many years of weak performance between banner years. It may seem like I’m ‘beating a dead horse’ with this concept of varying annual returns and relatively long strings of winning and losing trades, but it’s crucial for investors to fully internalize this before beginning to invest in short-term counter-trend strategies. The common tendency of investors to chase performance can be a huge issue in these sort of strategies, especially if investors don’t have accurate expectations of risk and performance. Consider how an emotional equity investor might have felt at the end of 2008 after losing roughly -32% over the previous two years and having seen that STCT3 could’ve generated a positive 72% during that same period – the natural human reaction would be to pile that money into the ‘winning strategy’, which we can see would’ve lost -9% over the following two years when the S&P generated nearly 40% returns. The bottom line is that short-term counter-trend is a unique strategy that every investor should at least consider adding as part of their portfolio, but truly understanding its characteristics to form realistic expectations for the strategy is crucial. In order to provide a more complete picture of what to expect from counter-trend strategies, my next blog post will take a deeper dive into the opportunity set of counter-trend strategies during various market environments. I’ll finally conclude the counter-trend investing discussion with some thoughts on practical implementation within investor portfolios.